The sun is setting on the Native Americans and the majestic creatures they worship, but what will the nighttime bring? This 25-payline slot from Pragmatic Play can offer you plenty of features to get you howling at the moon, like stacked wilds, free spins, giant symbols, respins, wilds and “money respins”, where filling the reels with moon symbols will win you the mega jackpot! Don’t let it get away… good luck! Discover the supernatural power of animal spirits revealed to the world by Native Americans in the Wolf Gold online slot! Spin the reels and find your inner beast - let the horse, wolf, puma, buffalo, or eagle lead the way to exciting prizes and a whole array of special features! Between Stacked Wilds, extra spins, bonus rounds with re-spins and jackpots, this online slot won’t disappoint you! Upon first glance, it is very clear that wildlife native to the American Mid-West was the main inspiration behind the Wolf Gold online slot. Different animals are featured on the reels, while the Grand Canyon looms in the background and tranquilizing sounds of the wind blowing, wolves howling and eagles calling overhead accompany the game. It is without a doubt one of the best slots we’ve seen from Pragmatic Play. The game is a 5 reel and 25 payline jackpot slot machine with an RTP of 96%. The buffalo is the highest paying symbol, which awards 20x the bet when it appears on all five reels in a winning combination. The symbols of the eagle, the horse and the puma follow in sequence of value, and the animals are accompanied by four letters: A, K, Q and J, which awards the lowest payoff. The titular wolf has been reserved to symbolize the wild. The wild can also appear in stacks and substitutes all other symbols, except the Scatter symbol represented by canyon rocks, or the Bonus symbol represented by a full moon. Remember, the Scatter only lands on reels one, three and five! Players can trigger the extra spins feature by landing three Scatter symbols, simultaneously, which is awarded with six extra spins. During these spins, reels two, three and four will spin together as one colossal reel that can land one giant symbol. If a player lands three more Scatters during one of the extra spins, he will be awarded with three extra spins. You’ll be happy to know that there is no limit to the number of re-triggers and extra spins that a player can earn! Near the top of the screen, you can also find three progressive jackpots, which players can win at any time. 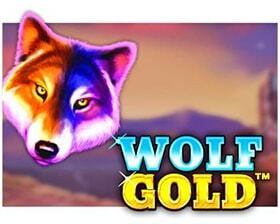 Keep reading our Wolf Gold slot review to find out how to get your paws on the Mega Jackpot! While you play Wolf Gold online, you can trigger the Money Re-spin Bonus by landing six or more full moon symbols across all the reels. The Bonus symbol can appear in stacks and will help you win one of the three jackpots. After triggering the bonus, all the other symbols will fade away, leaving only full moons on the reels. These become locked in place and the player is awarded with three re-spins. During the re-spins, the goal is to fill the rest of the screen with additional full moon symbols. Every time the reel lands on this symbol, it also locks in place and the re-spins count resets to three. 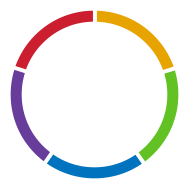 The round will finish once the player runs out of re-spins or when all fifteen positions are filled with moons. When the Bonus round ends, the cash value on all full moon bonus symbols will be added and the sum is awarded to the player. Filling all fifteen positions with the bonus symbols will award you the Mega Jackpot! The thrilling Wolf Gold online slot is available on your PC, tablet and mobile devices, so you’re able to try your luck on the Mega Jackpot at any moment! Discover the power of Mid-Western wildlife without stepping away from your screen. This colourful and bright online slot includes tons of opportunities for big wins. The colossal reel feature, as well as never ending re-spins are basically guaranteed to fill up your pockets!